President Trump made it clear: He wants to buy more American-made products and hire American workers. It's a part of his strategy to help boost U.S. economic growth, which has been sluggish. But he's said little about a key ingredient to really turn up growth, not to mention workers' lives: job skills and training programs. That might be because his administration proposes cutting federal funding for job training programs, though it hasn't spelled out how much, according to the Office of Budget and Management. It wants states, cities and towns to carry the weight of funding job training programs. It's a view at odds with is predecessor, President Obama, who broke records on federal spending for job training and apprenticeships. It also doesn't jive with the view of many economists and employers. Trump got to meet one of those employers on Tuesday. 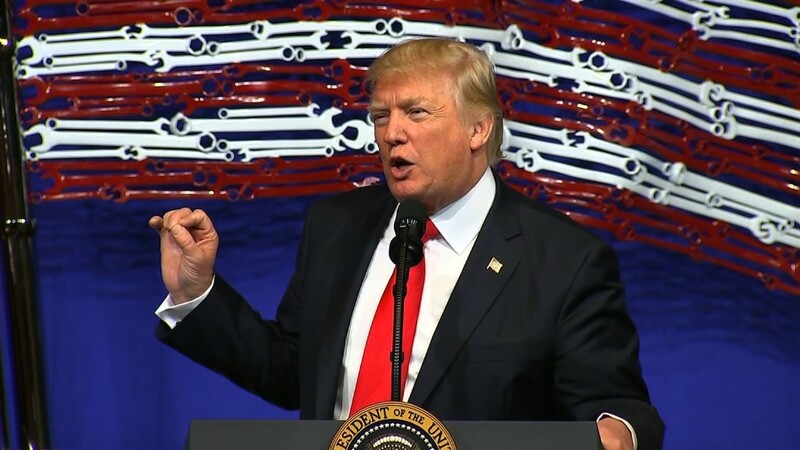 When Trump went to Kenosha, Wisconsin, to tout his Buy American executive order he told a crowd of technical students and manufacturing employees at the headquarters of Snap-On Tools: "The buy and hire American order I'm about to sign will protect workers and students like you." But Snap-On CEO Nicholas Pinchuk too wants to focus on job skills, not H1-B visas. As the head of the tool manufacturing company, he knows where the problem lies. "The best way to make America successful...is to arm our people with the technical capabilities that enable them to win that global contest for prosperity," Pinchuk said in a statement on the company's website. Pinchuk isn't alone. America's top economist, Federal Reserve Chair Janet Yellen, emphasized that point in a speech in late March. "Educational programs and training that lead to better paying and more steady work are crucial for people without college degrees, particularly lower-income workers," Yellen said. In short, research, anecdotes and experts show that job skills and training -- not restricting H1-B visas -- is the solution to a lot of problems for American workers. For example, former coal workers in Pennsylvania are learning to write computer code -- a skill in high demand -- at a free retraining program called Mined Mines, a non-profit. America had 5.7 million job openings in February. That's hovering near an all-time high. Part of that is good because employers are hiring. Part of it is bad because it means some employers just can't find skilled workers to match their openings. Trump did briefly touch on job skills Tuesday, saying education secretary Betsy DeVos "is working to ensure that our workers are trained for the skilled technical jobs that will, in the future, power our country." Trump also said, "workforce development and vocational training -- very important words," when German Chancellor Angela Merkel visited in March. But as Trump aims to cut down government spending, his words aren't backed up by important funding for job training and apprenticeship programs. Related: This Michigan toymaker pledged to never leave the U.S.
Federal job training programs have had issues. The Labor Department's own 2012 study found flaws in the job training programs for workers who lose positions due to free trade. Workers ended up in jobs they didn't want or didn't pay as much as their previous jobs. However, that is just one type of job training program, and liberals and conservatives alike tend to agree that most job training programs and apprenticeships are key to middle-class jobs, especially for those without a 4-year college degree. The White House's Office of Management and Budget did not respond to request for comment. Federal spending hasn't come to a complete halt yet. On Wednesday, the Labor Department approved $3.2 million in grants for training and reemployment services for workers in California affected by layoffs.